When a company advertises they have wedding rentals, what to do they mean? Generally, there will be a wide range of products available to allow for complete customization of your Saratoga wedding. Perhaps you would like a brilliant white wedding arch? A champagne fountain? Or, an elegant outdoor wedding tent, tables and chairs to accommodate 200 guests? 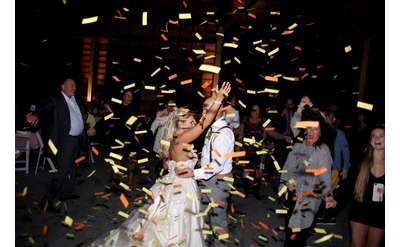 Whatever you can envision for your special day, these wedding rental companies in Saratoga Springs can usually provide it. Check with these local businesses — you might be surprised at the unique items they have to offer, some of which you may not have even thought of. 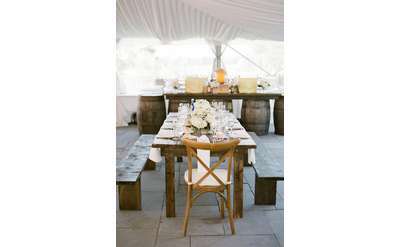 Rustic Robin Boutique Rental Co.
Rustic Robin is a boutique rental & design company serving the Adirondacks & Capital Region. We specialize in custom made rustic + vintage decor for weddings and events. Every item is is one-of-a-kind and handpicked with love.